“In this industry, folks, facts tell, and stories sell,” a pitchman identified as “Eddie” said in remarks introducing Reid. But “Eddie” said nothing about Reid’s involvement in Data Network Affiliates (DNA) and One World One Website (OWOW), bizarre and crashed opportunities linked to Reid business associate and fellow MLM huckster Phil Piccolo amid claims that affiliates were not getting paid. Piccolo also has been linked to TCN. Among other things, DNA claimed it could help the AMBER Alert program rescue abducted children, later claiming it offered a “free” cell phone with “unlimited” talk and text for $10 a month. Despite “Eddie’s” assertion that “facts tell,” he provided no substantiation of his claims about Reid and offered no information on Reid’s DNA/OWOW ties, apparently preferring instead to focus on the “stories sell” part of his emerging bromide. Reid, whose TCN cheerleading appeared to be somewhat subdued during the call, then passed the call back to Eddie. Participants who weren’t excited about those numbers need to check their “pulse,” Eddie ventured, predicting later that there would be “seven-” and “six”-figure earners. Like DNA and OWOW, strange events and incongruities have marked TCN’s existence. TCN also may be playing with fire by wooing recruits with claims about the purported tax advantages of joining. “What about the tax benefits that you receive from owing a home-based business?” Eddie asked yesterday’s conference-call listeners. “You can literally bring home 3, 4, maybe $5,000 — up to $7,000 a year in tax benefits. So many people are completely unaware that, just by being a part of a home-based business, they can save thousands of dollars every year by being a part of a home-based business. “Guess what? Join us with Text Cash Network and start saving today . . .” Eddie instructed while focusing on the purported tax advantages. Screen shot: Like DNA, TCN puports to operate a "processing center" in Boca Raton. 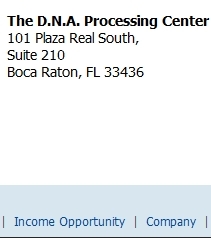 Screen shot: Like TCN, DNA purports to operate a "processing center" in Boca Raton. claimed to operate “processing centers” in South Florida, but the addresses appear to be rental services. Meanwhile, both TCN and DNA have OWOW — another Piccolo-associated entity — in common somewhere in the food chain. The earliest promos (early November 2011) for TCN appeared on OWOW’s website. Like DNA, OWOW appears to be a defunct corporation that continues to produce a website that sometimes goes missing and sometimes is rerouted to other sites. Affiliates of TCN, DNA and OWOW have complained publicly about not getting paid. All three firms have explained away those concerns in largely the same fashion: that payments have come or will come once a series of launches and prelaunches and website adjustments are completed. Each of the schemes spread in part through social-media sites such as YouTube and Facebook. One poster on a Facebook TCN site dubbed the “Text Cash Network- Official Group Page” complained today that “power line stats” are not working. “It stopped on the 12/28/2011,” the poster claimed. On another Facebook site — one dubbed simply “Text Cash Network” — a poster spammed an offer for JSS Tripler. Promoters of JSS Tripler are under investigation by CONSOB, the Italian securities regulator. Like DNA, Vertigo Theme Parks, Inc. was a registered Nevada corporation operating in Boca Raton (Fla.). The officer of Vertigo Theme Parks in Nevada’s revoked registration is listed as Kevin D. Johnson. Seeing the name Joe Reid made me think of when “little joe” was posting here in defense of AVGA. Same story line and tactics, and he liked to brag about how much money he was making from all his programs. Makes you wonder doesn’t it. admin: Makes you wonder doesn’t it.